Syrian Ejnad Akkad, a fighter for the Syrian opposition Free Syrian Army, who was wounded by a mine planted by the Islamic State group near the border with Turkey, lays on his bed at a hospital in Kilis, Turkey, Feb. 9, 2016. She screamed protests at the pain from her wounds, according to an eyewitness, VOA’s translator. The injuries were sustained earlier in the day in a Russian airstrike on Tell Rifaat, one town in a chain of northern Syrian settlements targeted by forces loyal to President Bashar al-Assad. The blistering week-long offensive has dimmed the rebels' hopes and transformed the battlefield in the north of the war-tortured country. Nearby on a gurney, an old man from the same town struggled for breath as he bled from grave leg and groin injuries. He and the three-year-old, transferred to a hospital inside Turkey, were among the few refugees admitted by Turkish border authorities. Syrian Aya Sharqawi, 6, wounded in an airstrike 10 days ago in her hometown of Tel Rifaat, Syria, lays on her bed at a hospital in Kilis, Turkey, Feb. 9, 2016. The old man died hours later. Doctors and clinics in northern Syria are struggling to cope. Heavy fighting is placing extreme pressure on the area’s already devastated health-care system, Doctors Without Borders warned Wednesday. The emergency medical charity said displaced people, including young children and the elderly, could be stuck living in the open in freezing conditions, with severe effects on their health. Pneumonia is a big concern. As the Assad government moves to press a choke-hold on Syrian rebels in Aleppo and the countryside beyond, backed by relentless airstrikes from Russian warplanes flying around-the-clock sorties, the numbers of civilian casualties are climbing rapidly across northern Syria. More are likely to die. Rebels fear that not only will opposition-areas in the city of Aleppo be cut off soon, but that Russian warplanes will expand their bombing runs to Idlib city, heralding a twin offensive aimed at interdicting supplies coming from Turkey through the border crossing west of Bab al-Salameh at Bab al-Hawa. FILE - Free Syrian Army fighters look at a Syrian Army jet, not pictured, in Fafeen village, north of Aleppo province, Syria. British officials estimate more than 1,380 civilians have been killed in Russian and Syrian government airstrikes since U.N.-brokered Geneva peace talks stalled last week. And bitterness is rising among Syrian rebel factions and civilians alike, with much of the anger not only directed at Damascus for the destruction it is wreaking but also at the West for what anti-Assad combatants and civilians alike see as Western passivity in the face of an offensive that has turned upside down the five-year-long uprising. By failing to act, the rebels say, the West is dooming the revolution to defeat. “Everything has changed. I don’t know how long our fighters can hold on for — I don’t know how they are managing to hold any positions,” General Salem Idris, the former chief of staff of the Western-backed Free Syrian Army, told VOA in an exclusive interview. Idris still advises moderate rebel commanders on tactics. “The fighters can’t continue to resist without modern anti-aircraft missiles,” he added. He says it is hard to get responses from U.S. military officials. “Since the offensive started, most of the senior ones have disappeared and aren’t to be found here in Gaziantep,” he says. FSA commanders have complained that since the start of the Assad offensive, they have been receiving fewer supplies than before. Idris says the weapons come through the Turkey-based Military Operations Center, which is staffed by Arab and Western intelligence personnel - including CIA officials - from 11 nations that support the FSA. A European diplomat disputes the claim by General Idris that the flow of weapons has been reduced, but says not all of the rebels' requests for specific weapons are being answered. 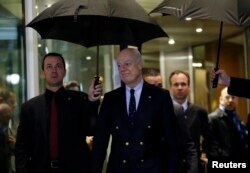 FILE - U.N. mediator for Syria Staffan de Mistura (R) arrives for a news conference on the Syrian peace talks outside President Wilson hotel in Geneva, Switzerland Feb. 3, 2016. That is a widespread view among rebels and opposition activists. “I think they are trying to force us to accept a deal at Geneva,” says Moayyad Yousef, an official with the Assistance Coordination Unit, which coordinates urgently needed humanitarian aid inside the war-wracked country for the main political opposition group, the Syrian Coalition. But U.S. officials say there is little to be done to counter militarily the Assad offensive and they argue the vicious Syrian civil war that has left upwards of 250,000 dead won’t be resolved by the clash of arms but through a negotiated political solution. Rebel commanders, including Idris, contend the offensive indeed could be halted, if rebel factions were supplied with shoulder-launched anti-aircraft missiles, thereby denying Assad control of the skies. Obama officials have long refused to supply so-called MANPADS and have urged Gulf allies to withhold them, too, fearing that some will be sold to jihadist groups like al-Qaida affiliate Jabhat al-Nusra, much as there has been a steady stream of Western-supplied TOW anti-tank missiles sold to jihadists by FSA factions. FILE - Kurdish People's Protection Units (YPG) fighters take position at a stronghold in Kobani, Syria. Anger is also rising at the role of the Kurdish People’s Protection Units, or YPG. Islamist and nationalist FSA insurgent commanders accuse the Syrian Kurds of revealing their true pro-Assad colors and of being in league with Damascus — a long-standing claim by the rebels that has been vehemently denied by YPG leaders in the past. “There is no difference between the YPG, the regime’s troops or the Russian forces, because they all attack us,” Abu Yousef Al-Muhajir, a top commander of Ahrar al-Sham, one of the most powerful Islamist militias in Syria, told ARA News, a local pro-opposition broadcaster. That view is echoed by Zakaria Malahefji, the political officer of the 3,000-member Fastaqim Kama Umirt, a brigade aligned with the rebel alliance Jaish al-Mujahideen (Army of Holy Warriors). “We consider the YPG now the same as the Assad regime,” he told VOA. Malahefji says YPG commanders broke an agreement not to attack the strategically important air base at Menagh, six kilometers south of the border town of Azaz, close to Bab al-Salameh. 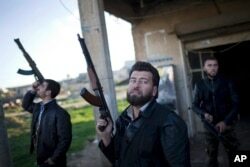 The rebels seized Menagh from the Syrian government after a lengthy siege in August 2013. YPG commanders contacted rebels holding the base Tuesday night and told them to withdraw, and Wednesday they took over the airfield, he added. YPG supporters have posted photographs of Kurdish fighters in combat at the base on social media sites. Malahefji claims the YPG received arms supplies from Damascus and Moscow months ago. In December, he says, a series of Syrian government and Russian helicopters flying in and out of the Kurdish enclave of Afrin, near Menagh, were believed to be ferrying in weapons. Operations by YPG forces and their allies in northern Syria the past few days have complicated the defenses the FSA and Islamist militias have tried to mount. “The YPG is acting as a spoiler tactically,” says General Idris, who believes the Syrian Kurds are facilitating the regime’s forces. “They say they are not coordinating with the regime, but that is a lie,” he claims. 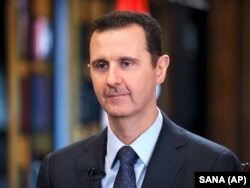 FILE - Syrian President Bashar Assad. Salih Muslim, the leader of the Democratic Union Party, or PYD, which dominates the YPG, has denied the rebels' claims in several interviews with VOA over the past three years, and he maintains no deal was struck with Damascus. A senior EU diplomat, though, told VOA Wednesday that he is no doubt that this week there has been close collaboration between the YPG and Damascus. “Of course, they are coordinating. The Kurds will do anything that will further their interests and national identity and bring them closer to get a small state,” he says. Whatever the truth, rebels and opposition activists say YPG has also been fighting FSA and Islamist units around the Kurdish enclave of Afrin and on the northwestern outskirts of Aleppo. Earlier this week YPG fighters seized 460 tons of wheat intended for the Syrian Coalition from a silo at Alqamiya village, the activists say. YPG commanders in Afrin say their operations are of a humanitarian nature, and that by expanding their territory they are in fact blocking government forces from making further advances. In a bid to avoid being hit by Russian warplanes, locals in at least two villages invited the YPG to occupy them. YPG commanders issued a statement Wednesday saying they are ready to meet the call of all civilians who request that the YPG secure their villages. That, the rebels say, is doing Assad’s work for him. Opinion: Have Russia and Iran ‘Won’ in Syria?